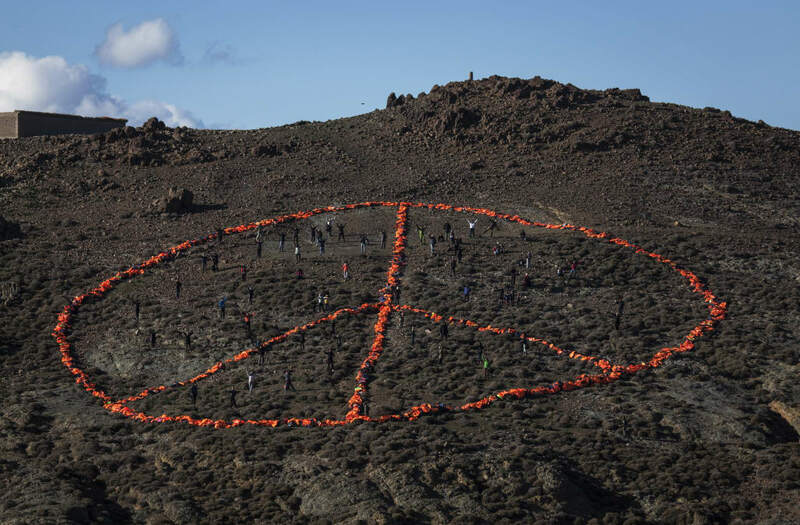 A bright orange peace sign appeared on a hillside on the Greek island of Lesbos on New Year's Day, transforming a growing pile of life jackets discarded by refugees arriving on the island into a message to the world. 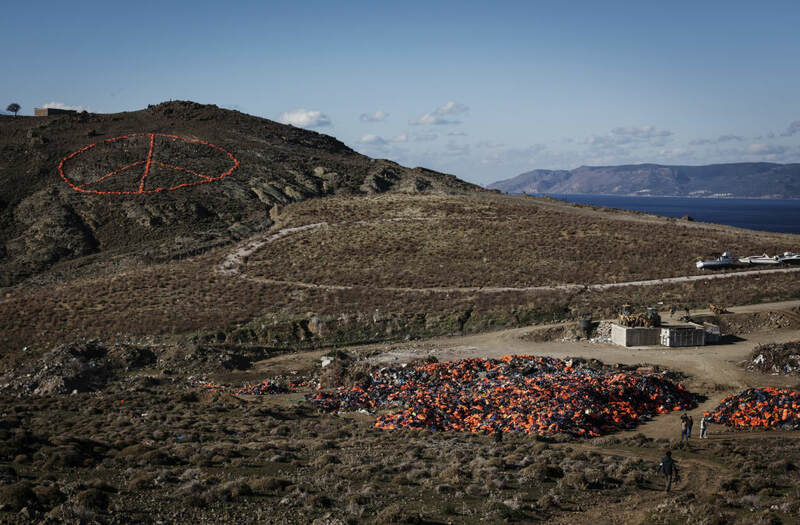 Dozens of Greenpeace and Médecins Sans Frontières (MSF) volunteers and local supporters teamed up to create the massive peace sign Friday on a hillside overlooking the small strait between Greece and Turkey that has become a main passageway for those fleeing to Europe. Made up of more than 3,000 life jackets and built by dozens of volunteers, the sign is a way to honor those who have made the journey and to urge peace in the new year, according to Greenpeace. Those involved in the project are calling for safe passage to those fleeing war, poverty and oppression. Thousands of people arrive on the island of Lesbos daily, packed into flimsy rubber dinghies and wooden fishing boats. Most are refugees fleeing conflict in the Middle East and Africa. More than 1 million migrants and refugees have arrived in Europe by crossing the Mediterranean in the past 12 months. Another 3,700 people perished in the sea last year while attempting the crossing. For many who make the journey, the first European arrival points have been on the Greek islands. The island of Lesbos in particular has seen a huge influx of people, in part because of its close proximity to the nearby Turkish coastline. More than 500,000 people arrived on the island in 2015 alone, but the small community has also been the site of unspeakable tragedies as some fail to make it safely to shore. In October and November, so many bodies had washed up on Lesbos that the local morgue ran out of space to house the dead. Tragic scenes played out weekly as ad hoc rescue efforts led by local and international volunteers were unable to deal with the sheer scale of new arrivals. As those who do manage to make it to shore quickly move further on into Europe, their life jackets stay behind as a growing reminder of the movement of people through the area, as well as the lives that have been lost. The life jackets have been slowly piling up in a dump on the island, near the town of Molyvos. The peace sign was created on a hillside overlooking the dump. The organizers of the project hope the sign is a visible reminder of the thousands who arrive daily and the hardships they are facing. "We also urge our supporters to share the peace sign image in honour of the refugees and migrants and as a way of thanks to the volunteers and local communities on Lesbos working to ensure that 2016 can start with a safe passage," wrote Aaron Gray-Block in a blog post about the peace sign on Greenpeace's website.